This article was published by ComputorEdge , issue #2805, 2010-01-29 , as a feature article, in both their PDF edition (on pages 9-14) and their website. When use of the World Wide Web was first becoming widespread, there was little standardization of how content — text and images, primarily — could be presented on Web pages. This was largely because there was little standardization among Web browsers, whose vendors were rapidly and continuously introducing new features to distinguish each company's browser from those of the competition. While the famed "browser wars" soon turned into a death match between Microsoft's Internet Explorer and Netscape's Navigator, content publishers sought a strategy for formatting public documents so that their appearance would be the same for all site visitors, and, as a bonus, could not be downloaded, altered, and then re-uploaded, posing as legitimate versions. This was particularly critical for binding agreements and other legal documents, which oftentimes needed to be printed out and signed. In response to this need, a number of document formats were created, because HTML — as terrific as it is for Web page markup — was certainly not an option, since Web pages are completely malleable, and each one can look different depending upon what browser the Web surfer might be using to view the page, and even what version of the browser. Adobe Systems has a history of developing various publishing technologies, and so it was no surprise when their Portable Document Format (PDF) became accepted as the Internet's standard. PDF conferred many advantages, and still does today. One advantage is that a PDF document contains all of the contents within a single file — quite unlike Web pages, which typically consist of an HTML file, one or more stylesheets, image files, and other types. Consequently, Adobe was able to avoid the headaches associated with trying to group multiple associated files into a single unit on a person's hard drive. Consider what happens when an Internet user downloads a Web page complete, and not just as an HTML file. Let's say that you are viewing the home page of a website titled X, and you wish to save the page to your local hard drive. Your browser may save the HTML file as X.html, but it also creates a folder, X_files, in which to store all of the associated files. If one of those ancillary files is deleted, for whatever reason, then the saved Web page is no longer complete, and probably will look wrong when you view the saved version later. This may not be critical for Web pages, but it is for Web-based documents. Business owners soon realized that there was another advantage to using PDF: The appearance of the content in a PDF document is independent of whatever browser has been used to download the PDF document, since all of the formatting is specified within the document, and cannot be modified by the casual viewer. At first, there was only one application available for viewing PDF files, namely, Adobe's own PDF Reader, which the company made freely available, in a smart move to popularize the document format. 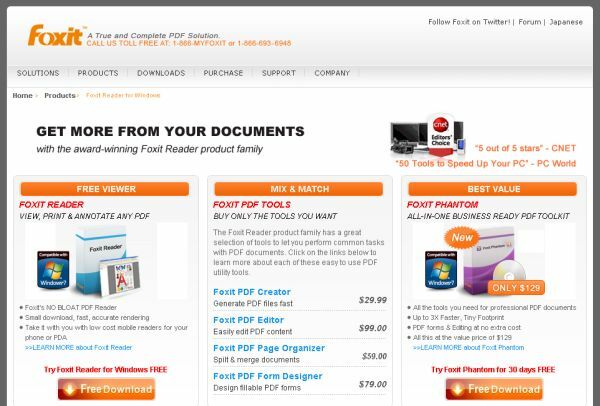 Eventually, however, the huge popularity of the PDF format lead software manufacturers to develop competing applications for viewing PDF files, some of which I will examine in this article. But first, let's look at the pioneer, which retains the lead position, at least in terms of popularity. Adobe Reader is both a stand-alone application for viewing PDF documents, and a browser plugin for doing the same within any supported Web browser. It should not be confused with the company's product for creating PDF documents, Adobe Acrobat, sometimes referred to as "Adobe writer". Even though Adobe Reader cannot be used to generate new PDF documents, it can display, search, digitally sign, and print PDF documents. In addition, PDF documents can have built-in user-editable form elements, allowing the viewer to type text into entry fields, click on checkboxes and radio buttons, and perform other operations intended by the document's designers. 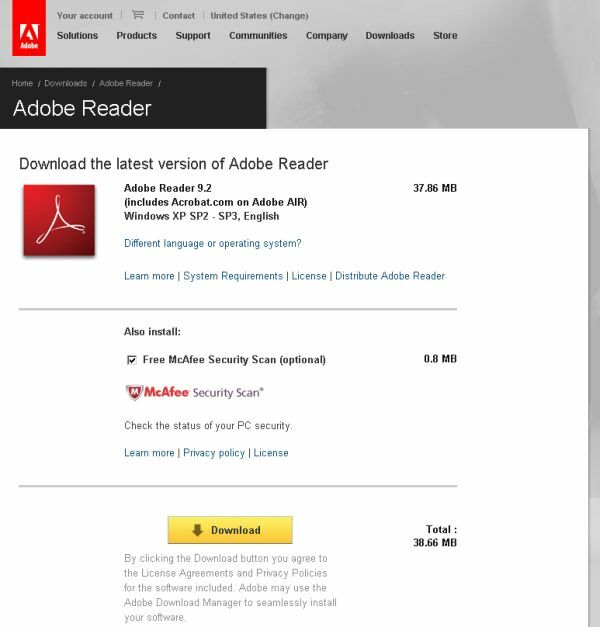 To obtain the most recent version of Adobe Reader, first visit the company's Web page, click the yellow download button, and follow the instructions. Depending upon what Web browser you are using and the security settings for that browser, you will most likely receive some sort of warning that the current Web page is trying to install software on your system. That is the plugin portion of Adobe Reader. You can avoid these warnings, and have a local copy of the installation file available on your own computer — which is usually a good idea, especially if you travel frequently with a laptop and may need to reinstall the software without access to the Web. 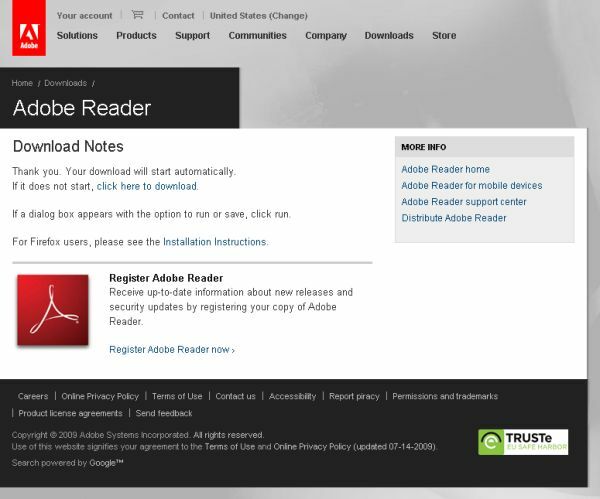 Simply decline to have Reader installed in your browser, and you will be shown a "Download Notes" page, with a link "click here to download". The latest version is, as of this writing, 9.2.0. Click the link to save the installation file (AdbeRdr920_en_US.exe) to some place on your hard drive where you can find it, such as the desktop in the case of Windows. Shut down all Web browsers that you currently have open, so the browser plugin can be installed without a hitch. Open the Adobe Reader installation file, and follow the instructions, which are straightforward and thus won't be detailed here. Unlike so many desktop applications nowadays, the Reader toolbar is quite spartan and accessible. All things considered, Adobe Reader does an excellent job of handling PDF files, as one would expect. But it hasn't always been this way: Years ago, Adobe Reader developed a reputation for being terribly slow to start up and to load documents — so much so that exasperated developers were driven to creating utilities to accelerate the process, by disabling unnecessary plugins. An example of this is Adobe Reader SpeedUp. Adobe Reader was also known for not consistently rendering symbols correctly, but that has improved greatly. It was frequently criticized for being bloated — more than ten times the size of replacement software. Sadly, that hasn't changed, and probably never will, because Adobe is known for building software that definitely needs to go on a digital diet. Partly as a result of the countless complaints lodged against Adobe Reader, it was inevitable that software companies and individual programmers would create alternatives. 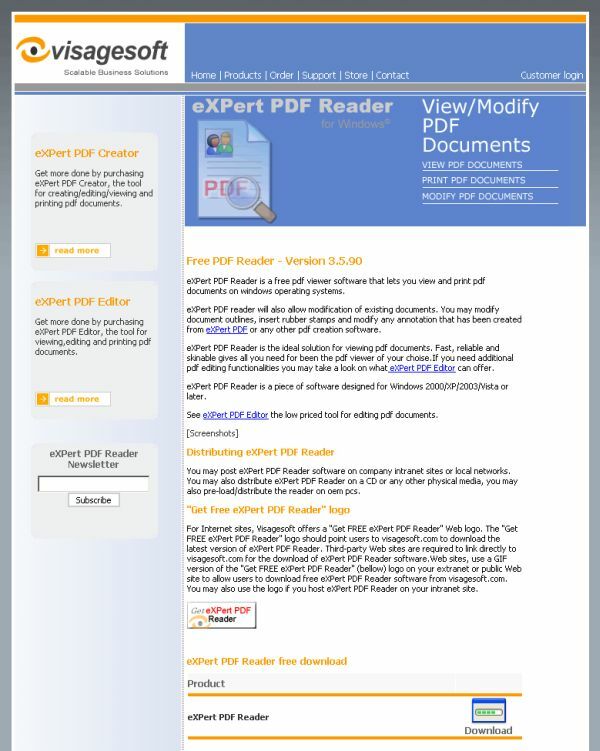 I will take a look at two of the better-known products, starting with eXPert PDF Reader, which is a free program developed and distributed by Visagesoft. The current version is 3.5.90. The file size is about a third of Adobe's offering, and installation takes a fraction of the time. A Windows-only application, eXPert PDF Reader allows you to easily view and print PDF documents, as one might expect. You may modify document outlines, insert rubber stamps, and modify any annotation that has been created from eXPert PDF or any other PDF creation program. 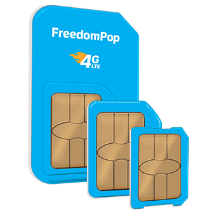 The latest version works much better than the 1.x series, which didn't always select or copy text correctly, but did always try to connect to an external website unnecessarily. The only remaining problem in the latest version, is that, when copying text from within a paragraph, it inserts hard newline characters at the end of every printed line, which forces you to manually concatenate all the paragraph fragments, or use a macro within your editor or word processor to do the same. 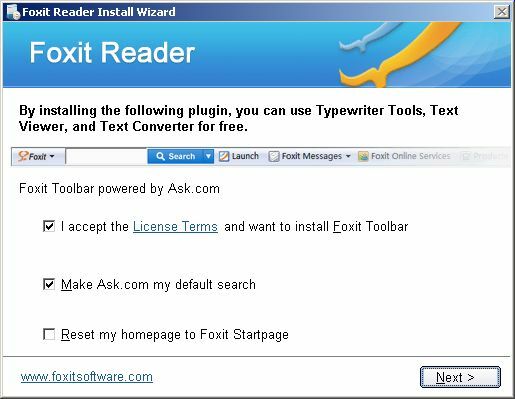 Perhaps the best known alternative to Adobe Reader, is Foxit Reader, which is blessed with the same low price tag as all the others. The current version is 3.1.4.1125, and its file size is even less than that of eXPert PDF Reader. Earlier versions of the product were so lightweight and self-contained, that it did not even need to be installed on one's computer, but could be used as a stand-alone executable — ideal for use on USB thumb drives. The latest version, however, does need to be installed. The process is painless, except for some gotchas on the dialog box where you have the option to add the Foxit toolbar to your browser (not necessary), make Ask.com the default search engine within your browser (not advisable), or change your browser's home page to Foxit's home page (they have got to be kidding). Immediately one will notice that the Foxit Reader toolbar looks a lot busier than the previous two that I examined. Upon opening a PDF document, and choosing to select some text, one will discover that, by default, mouse actions within the viewport are for moving the text up and down, just as they are in eXPert PDF Reader. In order to select some text, one must find and click on the marquee icon. This can be annoying, because all experienced computer users are accustomed to opening documents in other applications and immediately being able to select text, while using the keyboard for quickly paging up and down. This latest version does appear to fix some of the problems seen years ago, such as when a user copies text from two adjacent columns (imagine a traditional newspaper layout), and the program would mix the lines from each column together. Now, doing a regular stream selection, Foxit Reader is aware of the separate columns; and when doing a marquee selection, the program preserves the order of the lines. Adobe Reader, as well as the competitors I have considered here, are generally improving with time. It will be interesting to see whether programs such as these can continue to help preserve the dominant position of the PDF format on the Web, or if it will eventually be supplanted by a document format yet to be recognized or even invented. I have been very happy with how the licensing stuff has all worked with the [new client] program. You and Michael did a great job. Thanks.